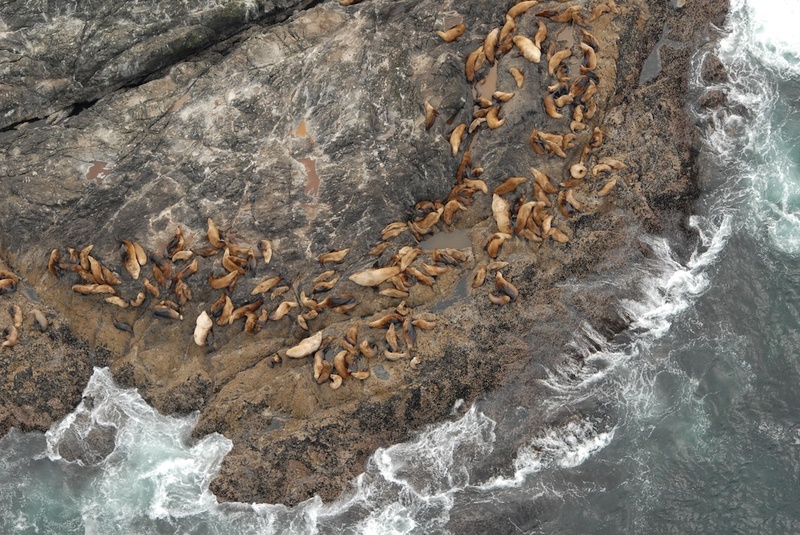 Did you know that stones are commonly found in the stomachs of Steller sea lions? These stomach stones or “gastroliths” are as big as 12 cm! Share your theories about why you think this might be after viewing the video below. 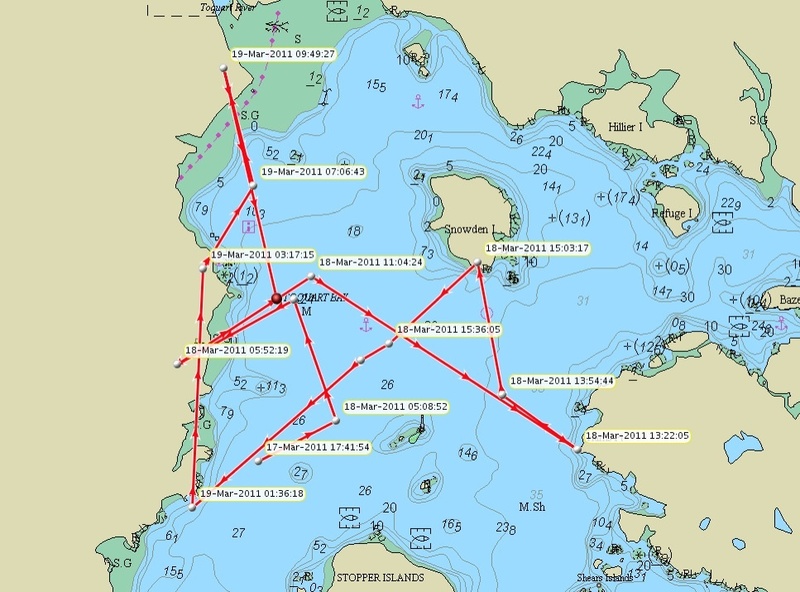 It provides you with information to help with this Marine Detective case. 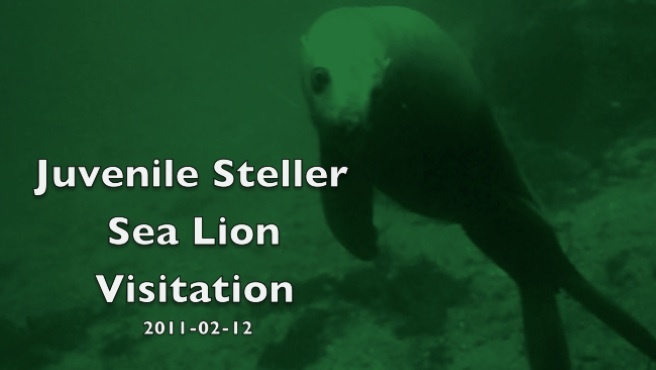 Click here for SeaDoc footage of Steller Sea Lions playing with California Sea Cucumbers. Update to the April/May information below: June 16, 2011. A picture is definitely worth a thousand words. 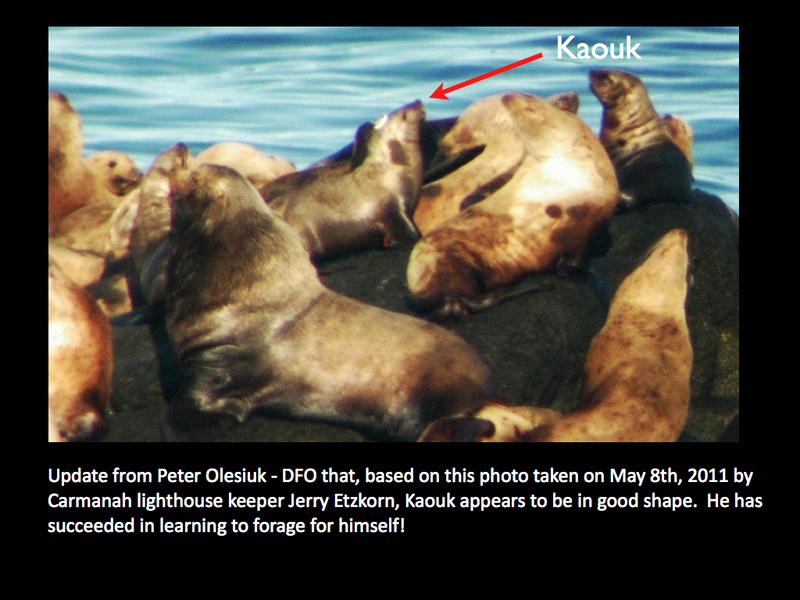 See below for April 14th and May 8th images of Kaouk the Steller sea lion healthy, fat, WILD and with his peers!! 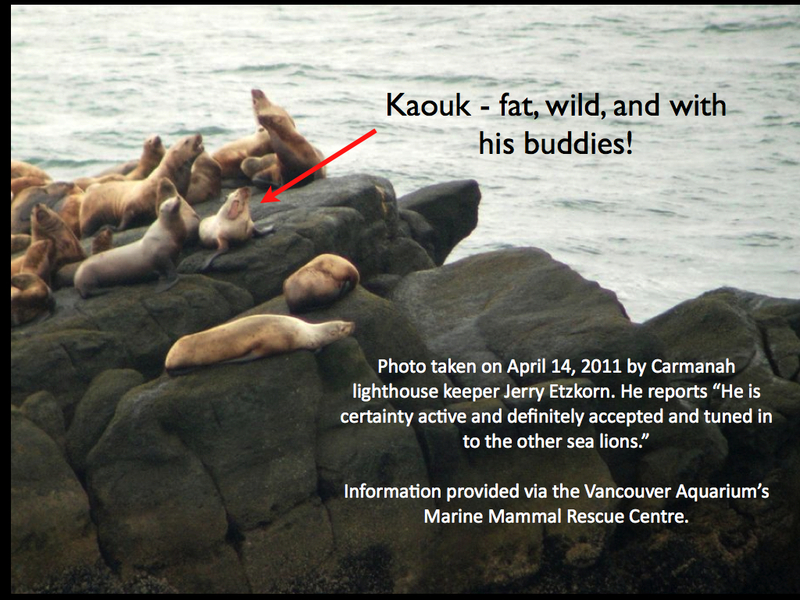 This photos and information has been provided by lighthouse keeper Jerry Etzkorn, via DFO and the Vancouver Aquarium’s Marine Mammal Rescue Centre (you can follow MMR on Facebook at this link). 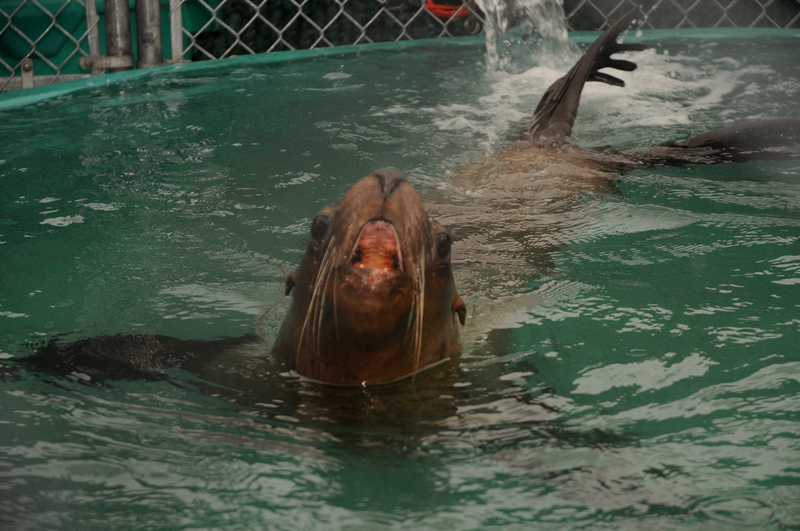 Kaouk, is the male Steller sea lion that walked into the Port Alice trailer park on December 16th and was flown to the Vancouver Aquarium’s Marine Mammal Rescue Centre. He inspired the students of Port Alice to write a children’s book and was released back into the wild on March 17th from southwestern Vancouver Island. For background information on Kaouk, including how you can follow him via satellite tag, click this link for a previous blog posting. Click the images to see them at a larger size. Another happy Kaouk update from May 8th, 2011. Thank you Peter Olesiuk. Screen grab from the video. 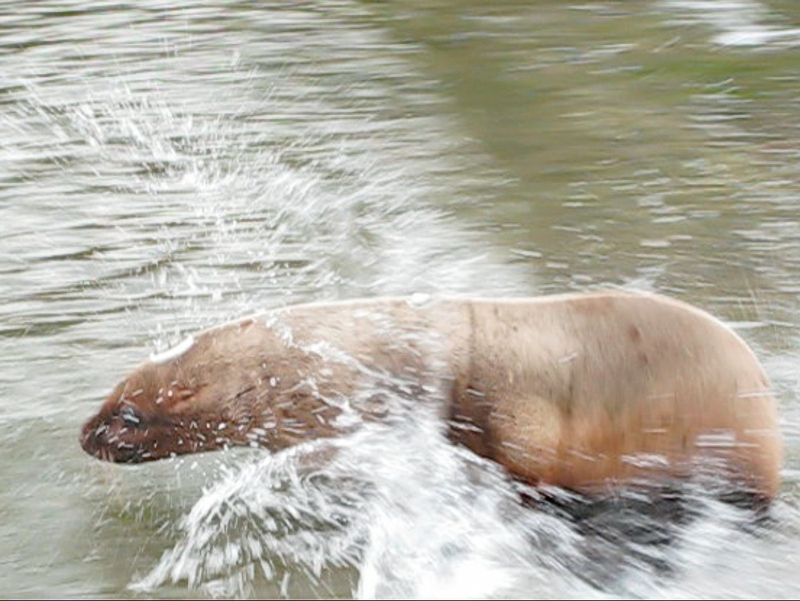 While diving yesterday, we had a visitation from two juvenile Steller sea lions. I’ve put a 1-minute clip of the encounter on-line, in a gallery with other videos of when these magnificent mammals have chosen to do a swim-by. Note that I do not “target” marine mammals while diving (this is in fact stipulated as being illegal in Canada’s draft marine mammal regulations) i.e. I do not jump in near sea lion haul-outs as I do not want to put pressure on the animals nor contribute to their becoming habituated to humans. Therefore, when we see them there is always an element of surprise and, of course, extreme privilege. See this link for the video clips. 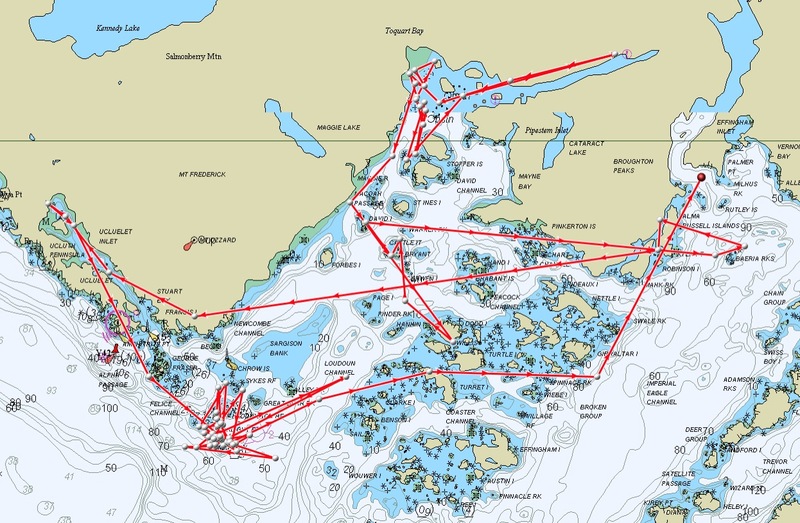 See this link for a previous blog posting that includes the natural history of Steller sea lions. Note: “Steller” is for the nautralist Georg William Steller who was doctor and naturalist on Vitus Bering’s second Kamchatka Expedition that also sailed to Alaska and the Commander Islands (1740 – 1741?). Below, please find a link to a slide show update on Kaouk, the juvenile male Steller sea lion that walked into the Port Alice (BC, Canada) trailer park on December 16th, 2010. 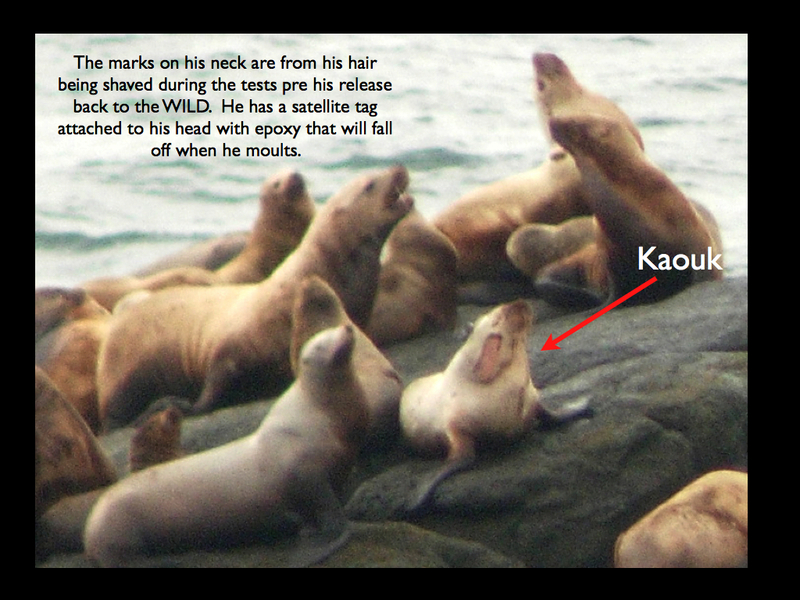 I had the privilege of visiting Kaouk at the Vancouver Aquarium’s Marine Mammal Rescue Centre on January 20th and was amazed at the improvement in his health. A decision will soon be made about his return to the wild. See this link for the 3 minute slide show (available in two sizes for ease of viewing). See this link for a background story in the North Island Gazette. Ms. Henderson’s students in Port Alice, B.C. put me onto a case yesterday. 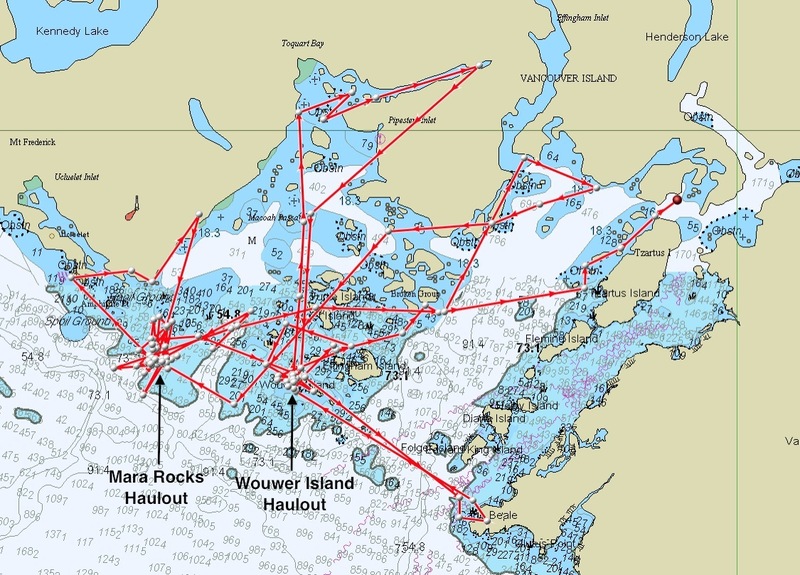 They had me check what was happening in the beautiful inlet in front of their community on north-western Vancouver Island and – what a fabulously noisy case it was! Pilchard (aka “Pacific sardines”; Sardinops sagax; up to about 40 cm) have brought in a whole food chain of activity: fishing boats, hundreds of gulls, many Steller and California sea lions and, that’s just what we could see on the surface! Pilchard were absent from the Pacific Northwest for about 50 years, having been very intensely fished into the early 1940s. With their return, our Coast has become much more vibrant with these fish fuelling a food web that includes humpback whales and both the Steller and California sea lions. Steller sea lions - male on right. Image: Uko Gorter Natural History Illustration. Having male Steller sea lions (Eumetopias jubatus) in our area is common. These giants (mature males up to 1,100 kg and 3.3 m) are the lighter coloured of the area’s two sea lion species. In the last 7 years or so, we have also had some male California sea lion males (Zalophus californianus) around Northern Vancouver Island from the Fall into the Spring but they are far more common to the South. California sea lions - male on right. Image: Uko Gorter Natural History Illustration. The California sea lions are the darker and much smaller sea lion species (mature males to 390 kg and 2.4 m). The mature males have distinct light colouration on parts of their head and a very unique shape to their foreheads. However, beyond these very apparent physical differences, you could be blind and still tell California sea lions and Steller sea lions apart! California sea lions bark. Steller sea lions growl. The sea lion activity I witnessed yesterday is really unique and all thanks to the return of the pilchard. I have never seen this many California sea lions anywhere around northern Vancouver Island and it is not often that I have seen mixed groups of both species hunting together. I checked with the locals in Port Alice and no one can recall ever seeing this many California sea lions in Neroutsos Inlet. This phenomena has fortunately been captured on video for you to enjoy (video from the Village of Port Alice). See below and look very carefully for the lighter coloured Steller sea lions among the barking Californians! All these sea lions are likely to all be male. The smaller ones are the immature males. Great thanks to the students of Seaview Elementary for caring and knowing as much as they do. Psst, I would be watching the water very carefully because this pilchard driven food chain has transient killer whales at its top! Update on the sea lion that crossed the road and entered the Port Alice trailer park on Dec 16th. Because he appeared to be underweight and lethargic, he was taken to the Vancouver Aquarium’s Marine Mammal Rescue Centre on Dec 18th (I think). It is a male Steller sea lion and was confirmed to be malnourished and dehydrated with no indication of what may have caused his condition. He has been named “Kaouk” after a mountain near Fair Harbour. My great respect to the people of Port Alice for knowing to call DFO’s marine mammal response line (1-800-465-4336) and have the RCMP conduct crowd control. Ms. Henderson’s class even had made up info brochures on how to best behave around the sea lions. Come on. You know you want to, just for 3 minutes. Come on the dives I did today. 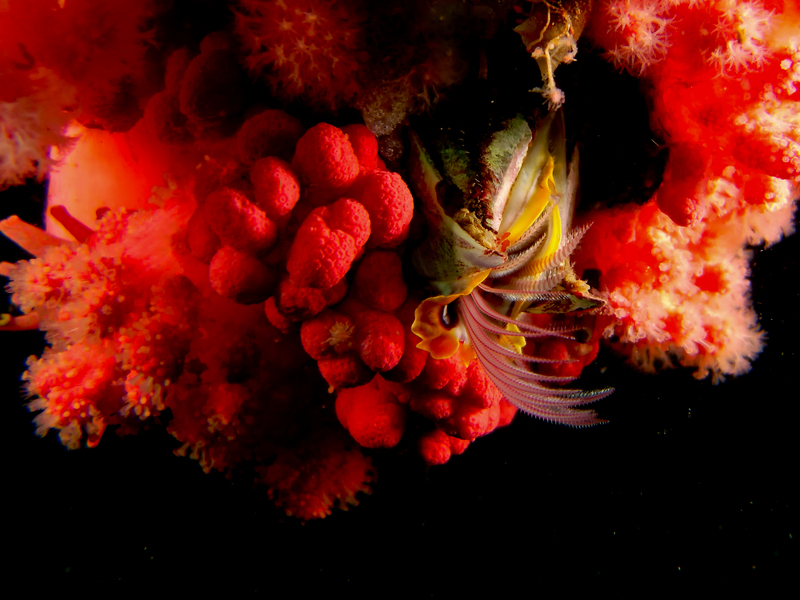 The little slide show I have put together, is a testimony to the grand, jaw-dropping biodiversity of this area (Northern Vancouver Island, B,C., CANADA). The Minke whale we saw, the fish using a sponge as a hammock, the bald eagle chick that took one of its first flights – all these are animals that I have learned from by knowing a small part of the world’s ocean well enough to be able to recognize individual animals. Such a privilege and such a joy to share with you. Come away with me . . . . click here.